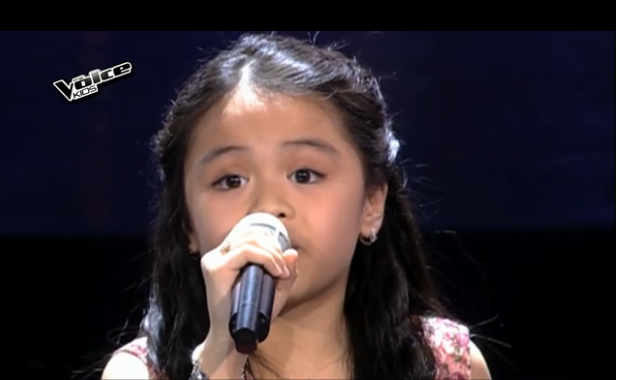 MANILA, Philippines - Lea Salonga's young artist Esang de Torres performed Nanette Inventor's 'Salamat, Salamat Musika' during the live semi-finals of 'The Voice Kids' Philippines Season 2 on Saturday, August 22, 2015 at the Newport Performing Arts, Theater, Resorts World Manila in Pasay City. The eight-year old 'Mini' Lea Salonga, Esang is among the Final 2 artists of the Broadway Diva. "Hasang-hasa ka na!" Coach Sarah said to Esang. "Complete package ka na," Coach Lea told the Tondo kid. Aside from Esang, fighting for a slot in the finale are her teammate Reynan Del-anay, Kyle Echarri and Zephanie Dimaranan of Team Sarah, Sassa Dagdag and Elha Nympha of Team Bamboo. Same with the first season of Voice Kids franchise, the outcome in the Live shows of the kids version will solely be from the results of the public's votes. The four artists who will get the highest percentage of votes from the public will move to the Grand Finals next week. This means that one of the coaches might have no representative in the grand finals, or have two star artists who will complete the Final 4, just like what happened to coach Sarah in Season 1. Text VOICE ESANG and send to 2366 for all mobile subscribers. 1 vote per artist per sim is allowed. Tariff is P0.50 per vote for Globe, TM, Smart, Talk 'N Text, ABS-CBN mobile subscribers and P1.0 for Globe postpaid subscribers. The episode of Live Semi-Finals on Saturday tops online conversations with '#TVK2Semis' among the trending topics. “The Voice Kids Philippines” airs every Saturdays, 6:45 PM and Sundays, 7:30 PM on ABS-CBN’s Yes Weekend.